Welcome to the fourth largest city in America. 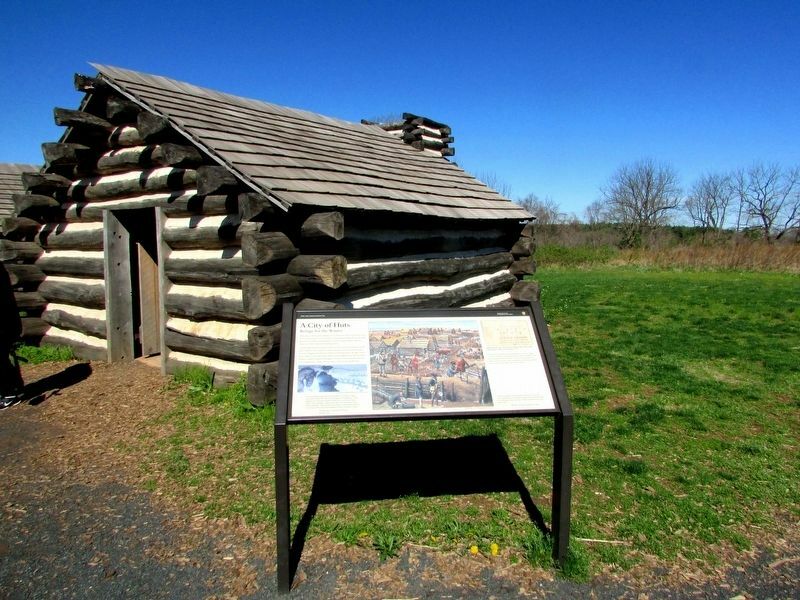 Arriving in this rural area in the winter of 1777, soldiers immediately began building 2000 log huts for shelter, earthworks for defense, and rubble roads to keep out the deep, boot-pulling mud. 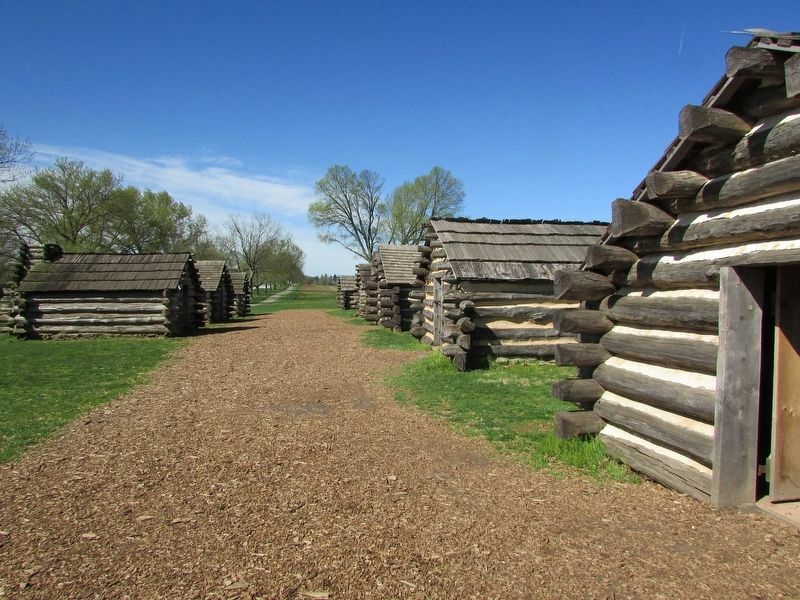 General Washington issued orders on the sizes and locations of the huts. Soldiers cleared all the trees from the countryside for miles around, dragging back the lumber to build log walls, shingle roofs, and rough bunks and stools. Most of this mighty task was finished within a month, despite shortages of tools. 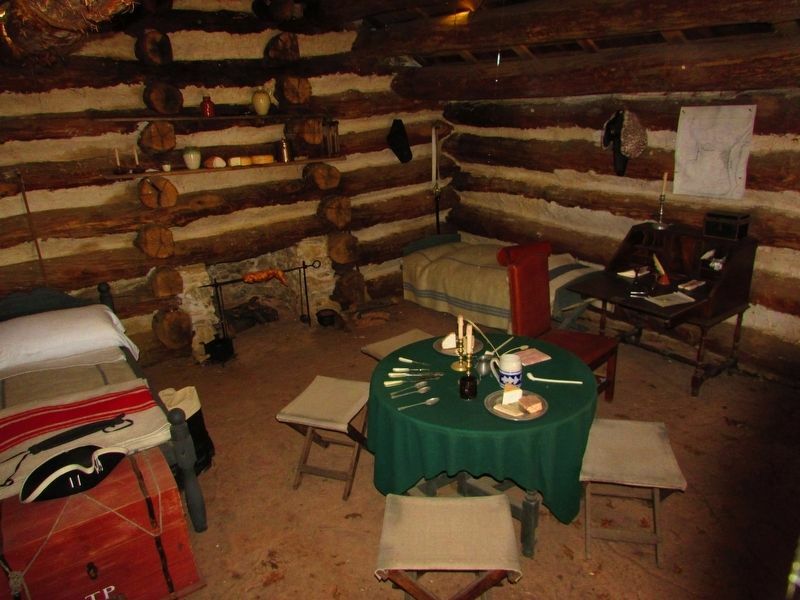 For six months the log city’s population rivaled Philadelphia, New York and Boston. in each brigade location, typically the smallest huts housed the soldiers and were located on the front line. As one’s rank increased, so did the size of the hut. The commissary kitchen was placed at the rear, farthest from the enlisted men. “The encampment was regularly laid out; the streets ran in parallel lines, neatness and order prevailed; and in viewing it from the hills, it had the appearance of a little city.”William Hull, 8th Massachusetts Regt. 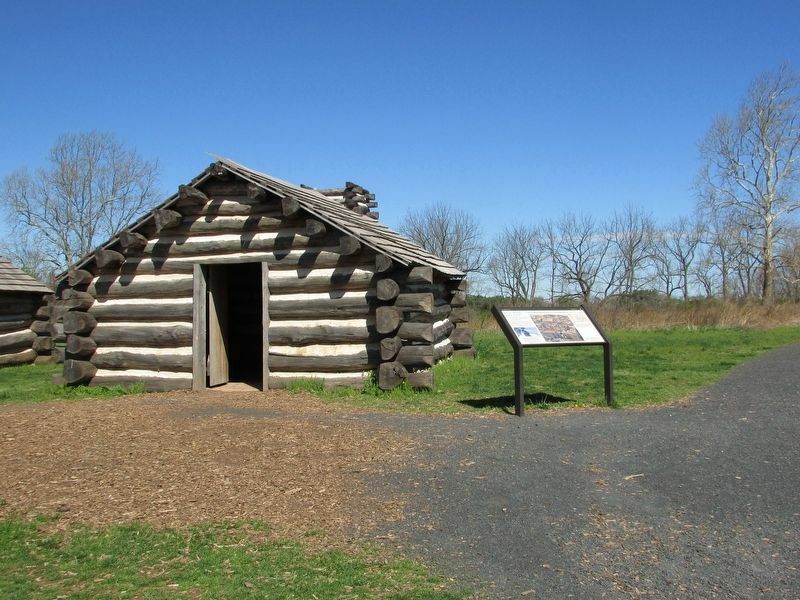 Erected by Valley Forge National Historical Park, National Park Service, Department of the Interior. Location. 40° 5.842′ N, 75° 25.528′ W. Marker is in King of Prussia, Pennsylvania, in Montgomery County. Marker is on North Outer Line Drive, on the right when traveling east. Touch for map. Marker is in Valley Forge National Historical Park at Stop 2 on the auto tour road. Marker is in this post office area: King of Prussia PA 19406, United States of America. Touch for directions. (about 300 feet away, measured in a direct line); On the Lookout (about 500 feet away); Are the British Coming? (about 500 feet away); Advance Redoubt (about 500 feet away). Touch for a list and map of all markers in King of Prussia. More about this marker. The center of the marker contains a picture of soldiers constructing their huts. (courtesy of Keith Rocco, National Park Service). 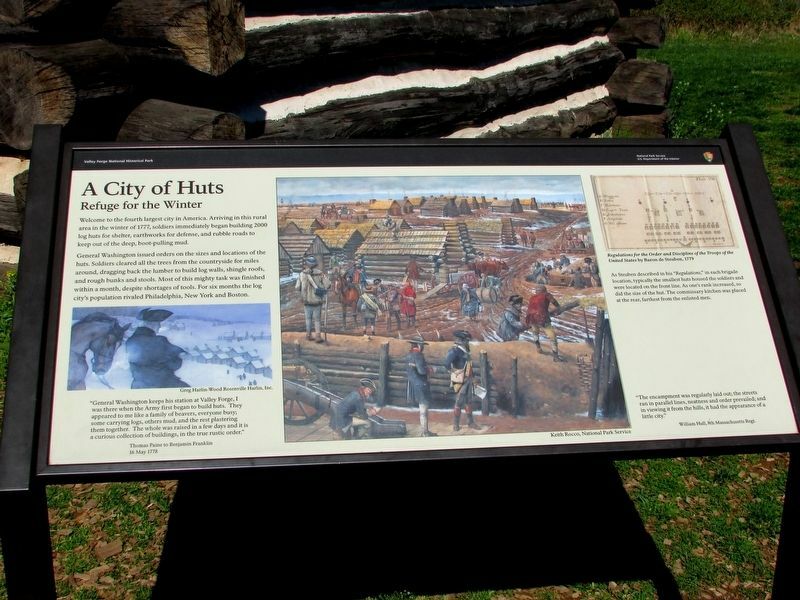 A picture of General Washington looking down on the completed hut city appears at the left side on the marker. More. Search the internet for A City of Huts. Credits. This page was last revised on April 16, 2019. This page originally submitted on April 16, 2019, by Bill Coughlin of North Arlington, New Jersey. This page has been viewed 32 times since then. Photos: 1, 2, 3, 4, 5. submitted on April 16, 2019, by Bill Coughlin of North Arlington, New Jersey.